Over the next couple of weeks I'm going to be travelling a lot and I'm bound to be applying a lot of my makeup on the go. 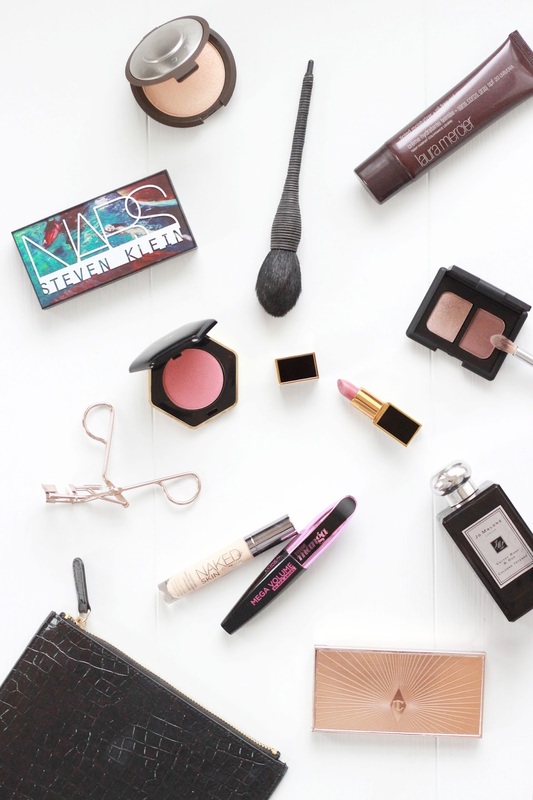 I have compiled a list of a handful of products which can be applied with ease using either my hands or minimal makeup brushes; perfect for variety of occasions. For my base and concealer I have opted for lightweight, nourishing options in the form of the Laura Mercier Tinted Moisturiser and the Urban Decay Naked Skin Concealer. This Laura Mercier offering just the right amount of light coverage, whilst allowing me to build it up if needs be. I like to pair this with a concealer in order to brighten my complexion and camouflage any blemishes. When I'm aiming to pack lightly I try and stick to packing palettes rather than individual products to save on space. The Charlotte Tilbury Filmstar Bronze and Glow is the perfect duo for creating sculpted, chiselled cheekbones for everyday wear, but I like to pack an extra highlighter just in case my skin is in need of an extra boost of glow. The Becca Champagne Pop highlighter not only adds emphasis on my contour, but it can be applied effortlessly in one sweep. The blusher that works in sync with this highlighter is the H&M Pure Radiance Blush in Golden Peach as it adds a pop of colour and subtle sheen to the skin. For my eyes I couldn't just stick to one offering so instead I chose two palettes. Both the Nars Dead Of Summer Dual Intensity Palette and Nars Eyeshadow Duo in Kalahari are suitable for day and night time wear. All the hues have a rich colour pay off that can be applied with ease and with a few lashings of the L'Oreal Miss Manga Mascara will transform my eyes. Although I am always tempted to pack an excessive amount of lip products, I have managed to narrow it down to only one; the Tom Ford Addison lipstick. This pink hued lipstick can be worn with a variety of makeup looks, so it's the perfect addition to my makeup bag. What is in your travel make up bag?